Her brakes have just gone out. While driving on the Long Island Expressway, Alina Tugend’s brakes went out. To make matters worse, her two children where in the back seat. Fortunately for her, she was at a standstill. She was able to inch over to the shoulder using her emergency brakes. Now she had another problem. Who should she call for help? What should she say? She didn’t know much except that her brakes were out. When she shared her story, she admitted it was scary. She had no idea what she should do or where to look first. In the end, things worked out. But here’s the surprising part. It’s common for impulse buyers to be seen as people with lots of discretionary income, pulling the “buy it now” trigger on anything that appeals to them. The truth is, in reality, more nuanced. Impulse buys depend on context. Google captured this in their micro-moments campaign. They show how these micro-moments create questions, desire and curiosity. · A pair of orange pumps creates love at first sight, prompting the desire to search for a pair of her own. · A father struggling to load his car, thinks “wouldn’t it be nice if we had an SUV?” prompting him to search for what he wants; the Acura RDX. We’re all impulse buyers, thanks to context. Micro-moments are an important piece of the inbound marketing funnel. They attract and convert customers in the moment, so the process is hyper-accelerated. Having your business SEO properly configured on major search engines and vertical search engines like Yelp, helps your customers to get the information they need in the middle of these impulse or need-it-now micro-moments. In Alina’s story, she needed someone to fix her car. She’d need a ride home, food for herself and her kids. She was driven to search for a solution to her problem. Her tool of choice? The Smartphone. 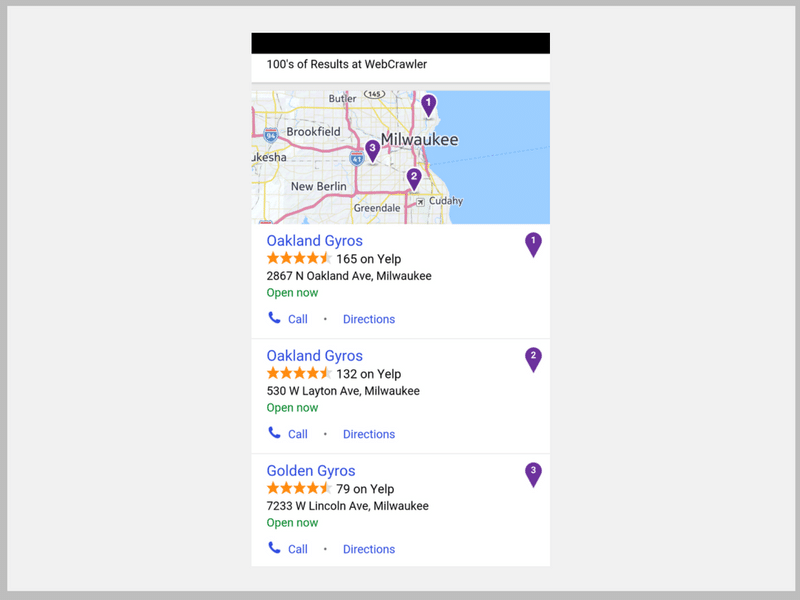 Within seconds of a simple search she has can see what’s local, hours of business operation, star ratings and reviews on the SERPs and click to call. Our mobile devices put the solutions to our problems at our fingertips. In a split second we’re able to find a tow truck, restaurant, auto body shop – anything we need. We need reassurance that things are going to be okay; we need to know we’re making the right choice when we buy. Because the wrong choice could be a disaster. So we rely on customers to make that happen. The very same customers who chose to share their experiences with the providers we’re now considering. In one click we can do the same thing, sharing our experience with Google searchers. Or any other review site that has your customer’s undivided attention. And what are these customers looking for? And the only way for you to provide that satisfaction is to stay in front of customers. But there are hundreds of review sites. Where do you focus your attention? Your impulse buyers. The key to staying in front of your customers is knowing them deeply. Knowing your customers deeply means you know their desires, goals, fears and frustrations. It means you know where they spend their time, how they spend their time and more. You see them as real people, rather than an imaginary persona. This is the part where almost every business says “we already know our customers.” Interview customers, conduct surveys and new details appear. A good customer persona depends on actual interactions and information from your customers. Next, map out their micro moments. Knowing your customers is a prerequisite – everything you do with your marketing afterwards is dependent on who they are. Get it wrong and your sales suffer as your marketing falls flat. So how do you get it right? You map out their micro moments. You approach your product (or service) from a customer’s point of view. Take our Greek restaurant, for example. What kind of micro moments would prompt customers to look for you? Most businesses have hundreds of micro moments they can focus their attention on. Which moments matter most? Which ones are profitable? At first glance, this seems like an overwhelming problem; until you find the solution. Think about our Greek example: Are the vast majority of customers visiting these restaurants because they’re traveling? Are they hungry locals looking for a quick bite to eat at lunch time? Greek natives with a hankering for home? Your marketing should position your business around these micro moments, providing customers with the reviews, the social proof they’re desperately looking for. If your business is positioned around micro moments, customer reviews should be positioned around your business. Wherever you present your business, prospective customers should see your reviews as well. It seems like a legitimate complaint but the reality is actually the opposite. When we think of impulse buyers, we typically think of people who can’t control themselves. These impulse buyers don’t need much convincing to get the products they already want. It’s the rest of us, the customers who need help, who struggle with doubt. With the fear of falling for yet another bad experience, yet another business that failed to deliver. These strategies are more important for other customers because they’re the ones who need reassurance. Impulse buyers, early adopters, laggards; as customers we have access to more buying options than ever before. But with more options comes uncertainty. We’re paralyzed by a plethora of choice. Which option is best? Which ones will hurt us? Want to stay in front of customers? Get to know your customers deeply; map out customer moments, positioning yourself around the moments that matter to them. Use mobile to meet them where they are and you’ll find you’re ready for your customers – impulse buyers or not.